Planning a DIY honeymoon? This week’s question of the week came from a bride who wanted to know why she should use a travel agent when there’s so much info online! 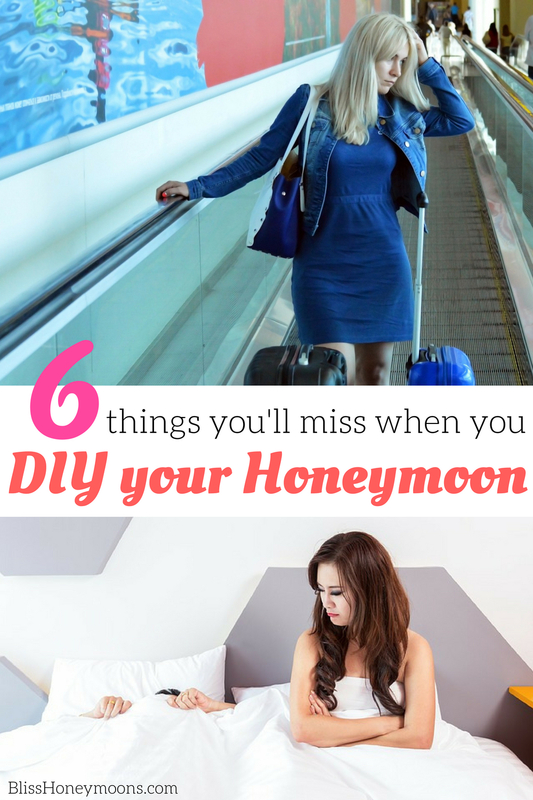 Here are 6 things you won’t find on an online travel site, and 6 things you’ll miss if you DIY your honeymoon. 1. You’ll get a better deal if you wait till next week. Have you ever clicked the confirm button on an online site only to have it tell you that you’d get a better deal if you waited a couple days to book? Of course not! Since one of the reasons people use an online site is instant gratification, an online booking site is never going to let you know that the hotel you’ve just selected is running a promo that starts next week, and that you would really be better off to wait a couple more days before you book. And here’s the rub-if you book online and a better rate comes out after you’ve booked, the online site won’t adjust your price. Here at Bliss Honeymoons, if a better rate becomes available after you’ve booked, we can usually obtain the new rate for you. 3. This resort is great if you want to party like a rock star, and don’t mind a room that hasn’t been updated since 1974. 4. Your hotel is closed for the season. Enjoy the Super 8! In the last year there have been two big cases of couples who booked online, only to learn that the hotel was closed for the season when they arrived. (One was a Greek Island honeymoon, the other a 25thwedding anniversary in Costa Rica) In both of these cases, the online site refused to assist them until they could confirm that the hotel was actually closed. But how can you confirm a hotel is closed when there’s no one there to confirm it? Exactly! 5. You could have gotten that candlelight dinner on the beach free by booking the next room category! 6. Your connecting flight leaves 15 minutes before you arrive. Welcome to Duluth! So, while online sites are great for a quick weekend getaway or business trip, your honeymoon is a trip where a pro can make all the difference between a great honeymoon memory, and an absolute disaster. While many people still believe that using an agent means paying more, a great agent will be able to save you both time and money. If you’d like to learn more, contact us today!